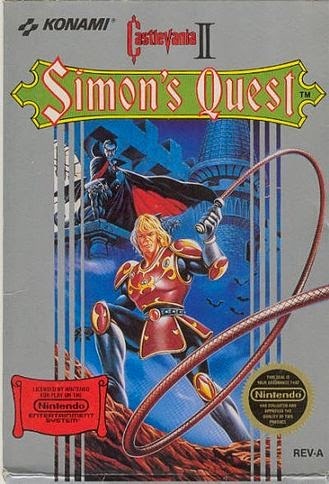 Ever since the Angry Video Game Nerd did his now infamous review of Castlevania II: Simon's Quest for the NES, it seems to be insanely popular for people to hate on this game. While I am a huge fan of the AVGN and admit that his points are very valid, I have to confess that I am a big fan of Castlevania II for the NES. It has a lot of well known problems but a lot of these come from the fact that it was originally a Famicom disk drive game in Japan. This means that it should have had a save feature similar to The Legend of Zelda when being brought stateside but battery backed cartridges were a risky expense for a game so different from the original. The other major issue was the cryptically poor translation that turned the game into what is affectionately called a "Nintendo Power Game" which means you basically need a guide to decipher how to progress through the game. There are other issues such as the day/night transition but honestly, I always enjoyed the ambition and exploratory nature of the game. It was the first step into the brilliant "Metroidvania" gameplay style that would result in some of the finest games in the entire series. Dialogue has been completely rewritten resulting in useful clues and hints. Sign graphics have been tweeked making it much easier to keep track of where you've been and where you need to go. The only thing that would make this better would be an actual cartridge release but a ROM and your favorite emulator will have to do. Make sure you own the original cartridge before downloading the ROM. Click here to download the patch from The Almighty Guru's site!